What Do You Do When There are Birds in the Chimney? Your chimney needs to be clear for smoke to rise through when you use your fireplace. If you have birds in the chimney, this can cause a lot of problems. They can get stuck and prevent you from being able to start a fire. But how do birds get stuck in your chimney? How can you get them out? We’ll answer this question and many others in this article. Let’s get started. How Do Birds Get in the Chimney? The first thing you need to know is how birds get into your chimney. 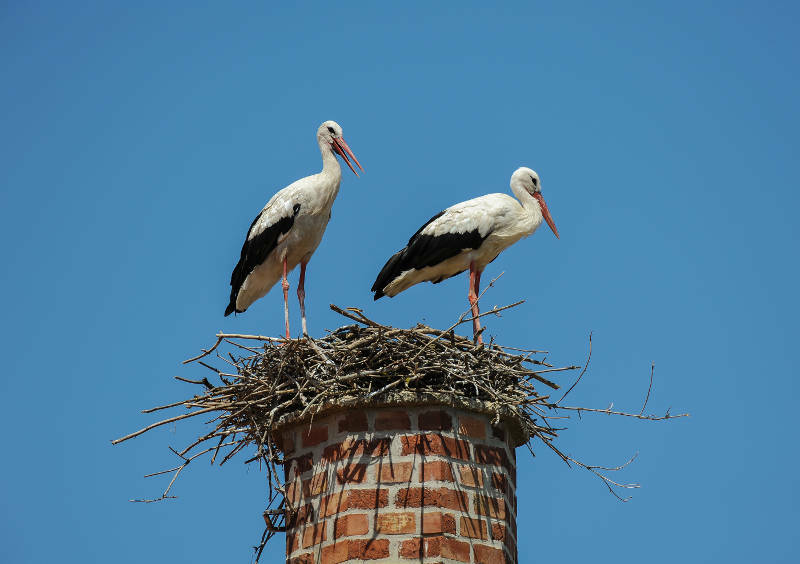 If a bird is nesting on or near your chimney, it may wander into it and get stuck. This is very alarming for both you and the bird. If your chimney crown or chase cover is damaged, it’ll make it easier for birds to gain access to your chimney. You’ll need to fix this problem immediately. Get a free quote from Early Times for chimney chase covers or chimney crown repair or replacement. Not all birds end up in your chimney by mistake. Chimney swifts are birds that make their nests in chimneys rather than outside of it. Chimney swifts are birds that spend winters in South America but come up north to breed. They’re found mostly in the East, Southeast and Midwest. They’re also protected by federal law because the population has been decreasing. That means a chimney sweep can’t remove the bird or its eggs from your chimney. If a bird gets stuck in your chimney there are going to be some specific sounds that you’ll be able to hear. There will be a lot of scratching, rustling and flapping. This is because the bird will be struggling and scared. If your flue was mistakenly left open, the bird can even end up in your house. However, chimney swifts won’t be struggling when they’re in your chimney – that’s exactly where they want to be. You’ll need to listen for chirping especially if there’s a nest of babies. How Long Will a Bird Stay in Your Chimney? There’s really no telling how long you’ll have birds in your chimney. When the bird is stuck, it’s a matter of getting itself out or you helping it out of your chimney. Otherwise the bird could die in there which is an entirely different problem you’ll need to worry about. Chimney swifts might have a time frame. Once they nest, the mother will sit on her eggs for up to 20 days. Even after the babies hatch, they’ll be in your chimney for 30-45 days as they learn to fly and be on their own. You’ll be stuck with those birds for quite some time. You’re probably wondering how you can get the birds out of your chimney. If the bird is stuck, you’ll probably know right away because it’ll be making a lot more noise. The best thing you can do is close your fireplace door, open your flue and trap the bird in your fireplace. Once you’ve done that, call animal control immediately. Chimney swifts are a little more difficult to deal with. For starters, they’re much harder to detect because they make a lot less noise. Even worse, if a chimney sweep or inspector finds the bird in your chimney, they won’t be able to do anything because they’re protected by law. The only thing you can do when you have a chimney swift in your chimney is wait. You know that there’s a maximum time frame of 3 months they’ll be there and once they’re gone, you can clean up. As we mentioned above, having a fully functioning chimney crown and chimney chase cover can prevent this from ever happening. Since you can’t remove the chimney swift from your chimney, you might as well do everything in your power to prevent them from getting in there in the first place. As it should come to no shock, there are many dangers for the birds in your chimney. If you’re unaware that they are there and you start a fire, they will die from the smoke and heat. Also, if the bird is stuck and can’t find a way out, it’s not going to last long. That being said, there are many risks to you if there are birds in the chimney. A bird nest can plug up your chimney and if you start a fire without knowing it’s there, you will have smoke billow back into your home. Breathing in the smoke is very dangerous and can lead to death. This is why it’s important to have your chimney cleaned and inspected each year before using your fireplace. You’re also at risk of histoplasmosis which is an airborne disease spread through bird droppings. While the common adult wouldn’t know they’re carrying the disease, it’s extremely dangerous for infants, the elderly and people with compromised immune systems. Birds can also carry mites, flees, ticks and other pests into your home. These bugs can also carry harmful diseases to humans and pets putting everyone in your home at risk. Having bids in the chimney is a serious problem that can’t be ignored. Adding a chimney chase cover or chimney crown can play a major role in preventing the problem from occurring in the first place. If a bird does get stuck in your chimney, you’ll have to act quickly by helping release it. However, chimney swifts can’t be disturbed. Once they leave, make sure your chimney is thoroughly cleaned to limit the risk of diseases and pests in your home. Early Times is Chicago’s chimney expert. We’ll make sure your chimney is cleaned and inspected so you don’t have to worry about any health concerns. Also, we’ll help fix or replace your chimney crown or chase cover. Get a free quote now and see why so many homeowners have trusted us with their chimney projects.